Wolfsburg /Doha, January 2011. Future mobility is one of the most stimulating topics of our time. The key question here: Just how much could the energy consumption of cars be reduced if all the stops were pulled out for efficiency? There is now an answer to this question, and Volkswagen is delivering it in the form of the new XL1. Combined fuel consumption: 0.9 l/100 km. No other hybrid car powered by an electric motor / internal combustion engine combination is more fuel efficient. 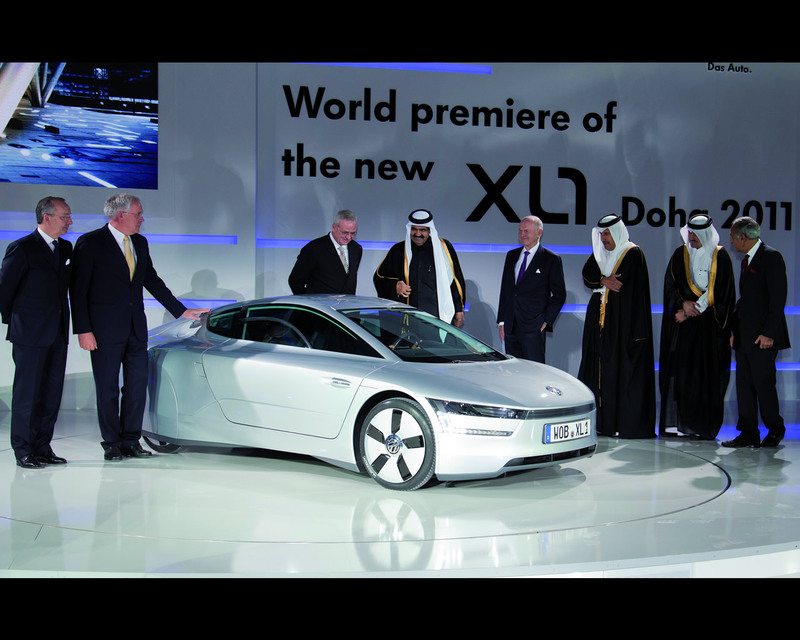 The prototype is unveiled in a world debut at the Qatar Motor Show 2011 (26 – 29 January). 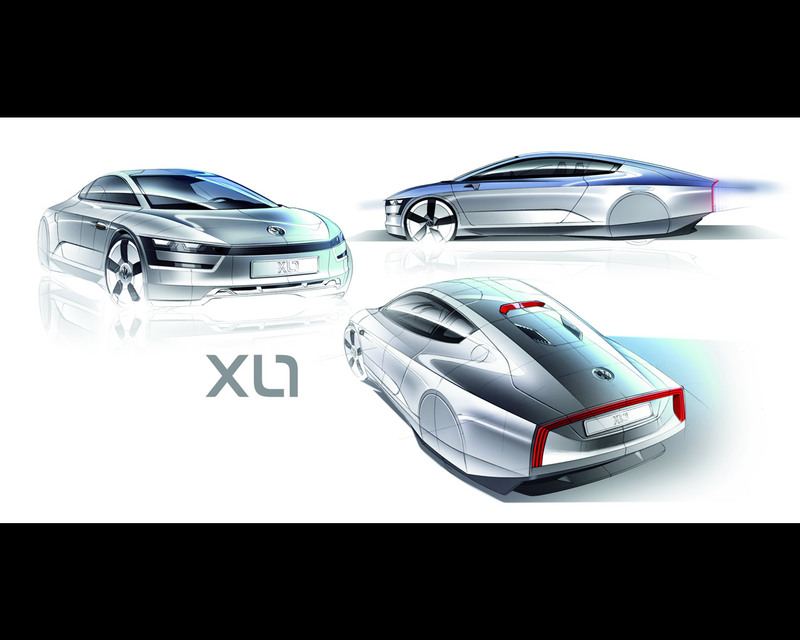 Conceptually, the XL1 represents the third evolutionary stage of Volkswagen’s 1-litre car strategy. 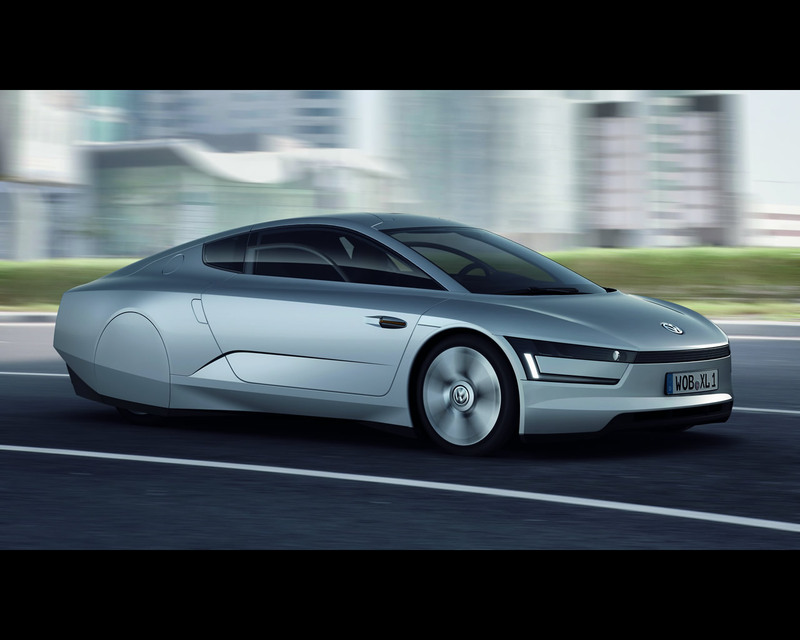 First stage is Volkswagen 1 Litre concept 2002 , the second one is the Volkswagen L1 Diesel Hybrid Concept 2009. 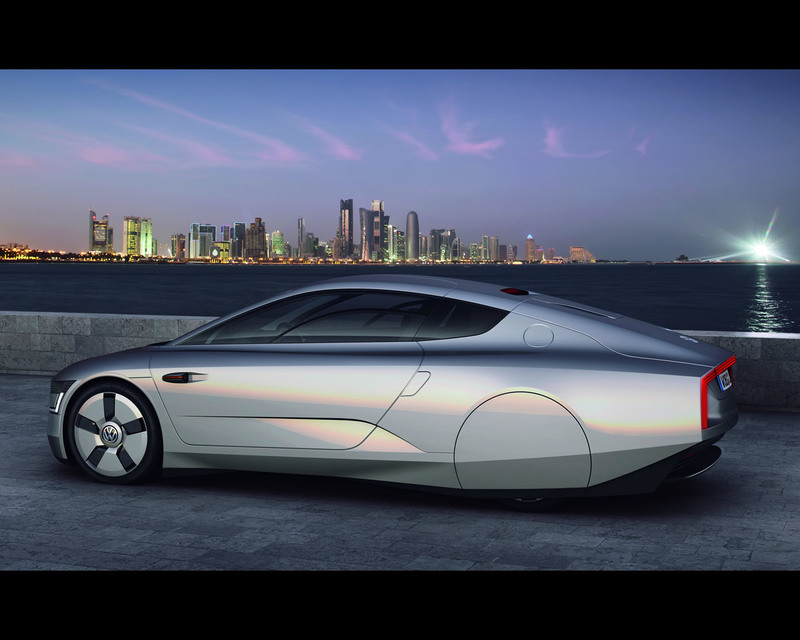 When the new millennium was ushered in, Prof. Dr. Ferdinand Piëch, who is today Chairman of the Supervisory Board of Volkswagen AG, formulated the visionary goal of bringing to the market a production car that was practical for everyday use with a fuel consumption of 1.0 litre per 100 km. In the new XL1, Volkswagen is demonstrating that this goal is now within reach. 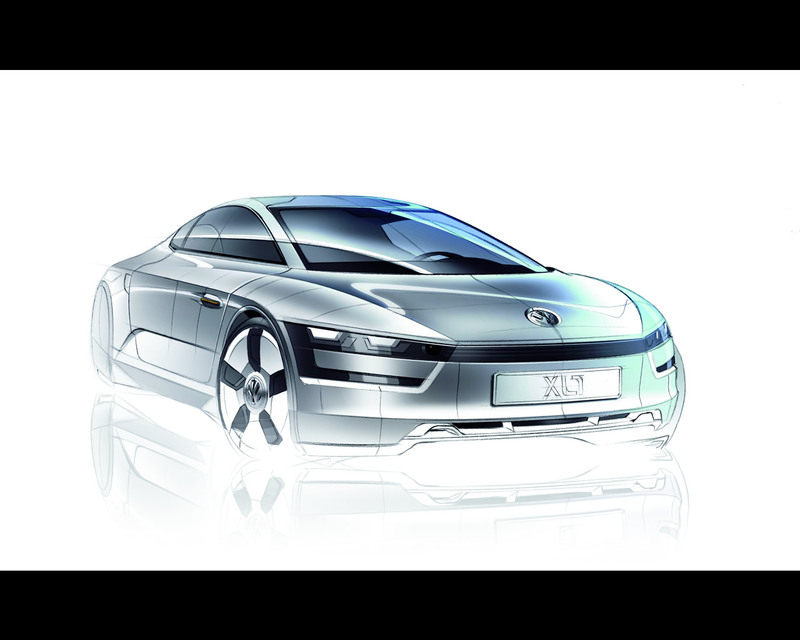 The new Volkswagen XL1 attains a CO2 emissions value of 24 g/km, thanks to a combination of lightweight construction (monocoque and add-on parts made of carbon fibre), very low aerodynamic drag (Cd 0.186) and a plug-in hybrid system − consisting of a two cylinder TDI engine (35 kW/48 PS), E-motor (20 kW/27 PS), 7-speed dualclutch transmission (DSG) and lithium-ion battery. 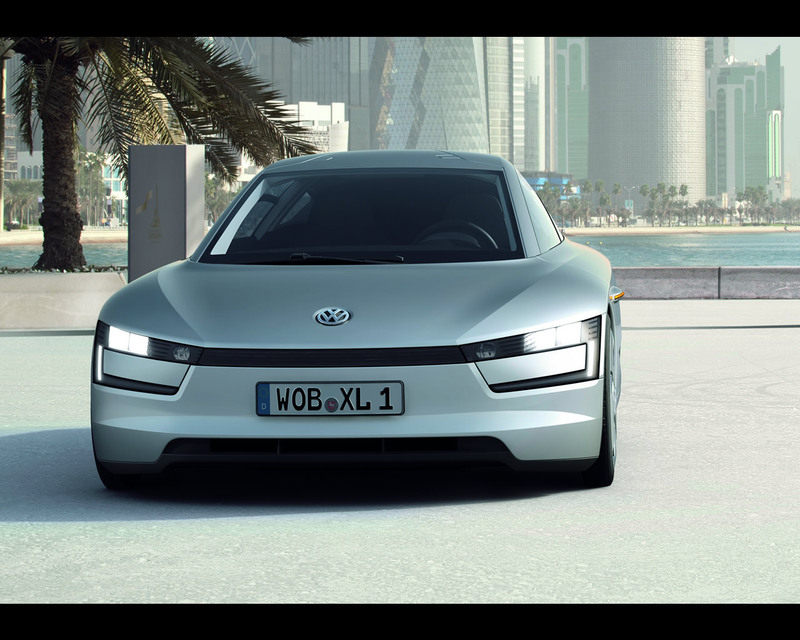 The results: with fuel consumption of 0.9 l/100 km, the new Volkswagen XL1 only emits 24 g/km CO2. 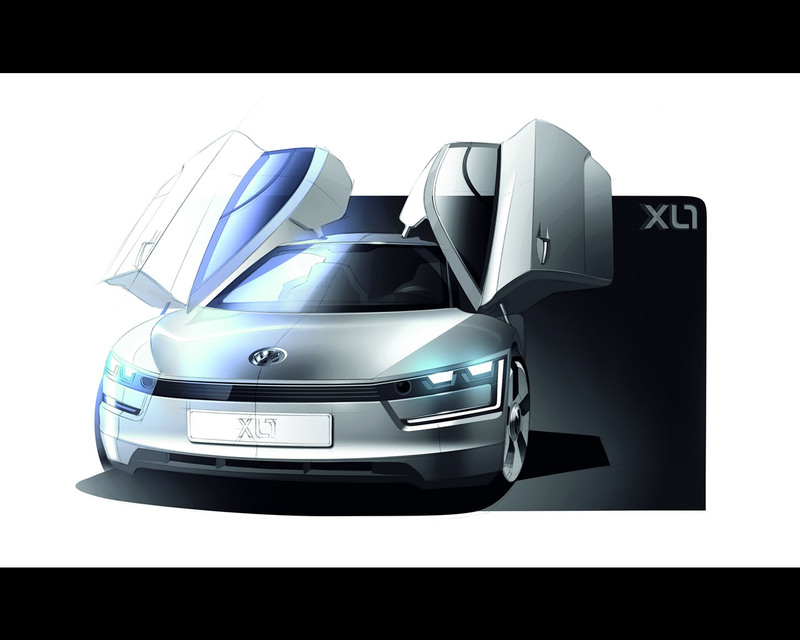 Since it is designed as a plug-in hybrid, the XL1 prototype can also be driven for up to 35 kilometres in pure electric mode, i.e. with zero emissions at point of use. The battery can be charged from a conventional household electric outlet. Naturally, battery regeneration is also employed to recover energy while slowing down and store as much of it as possible in the battery for re-use. In this case, the electric motor acts as an electric generator. Despite the very high levels of efficiency, developers were able to design a body layout that offers greater everyday practicality, incorporating side by side seating rather than the tandem arrangement seen in both the first 1-litre car presented in 2002 and the L1 presented in 2009. In the new XL1, wing doors make it easier to enter and exit the car. Further progress has been made by manufacturing body parts from carbon fibre reinforced polymer parts (CFRP), a technique used in Formula 1 car construction. Once again, Volkswagen has successfully achieved significant reductions in production costs – an important step forward to make viable a limited production run of the XL1. Background: together with suppliers, Volkswagen has developed and patented a new system for CFRP production in what is known as the aRTM process (advanced Resin Transfer Moulding). 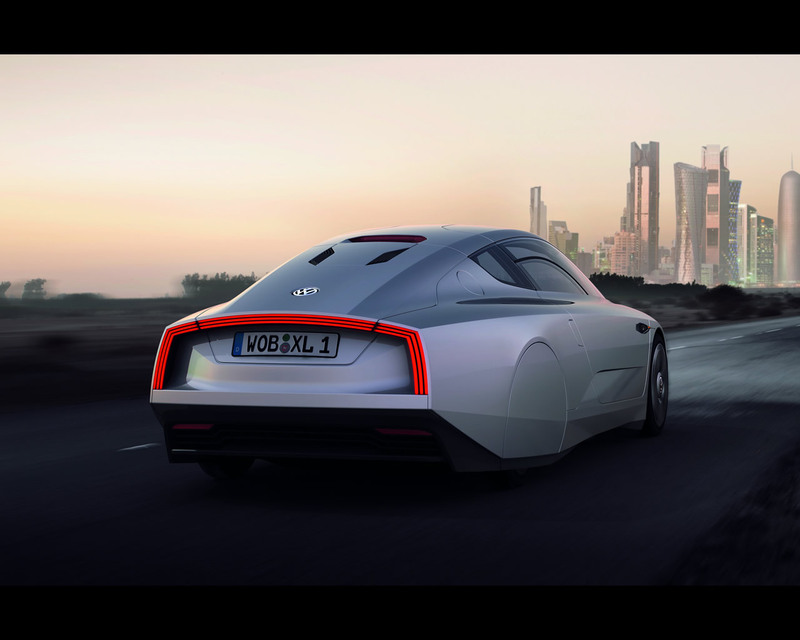 The new XL1 shows the way forward for extreme economy vehicles and clean technologies. It also demonstrates that such cars can also be fun. 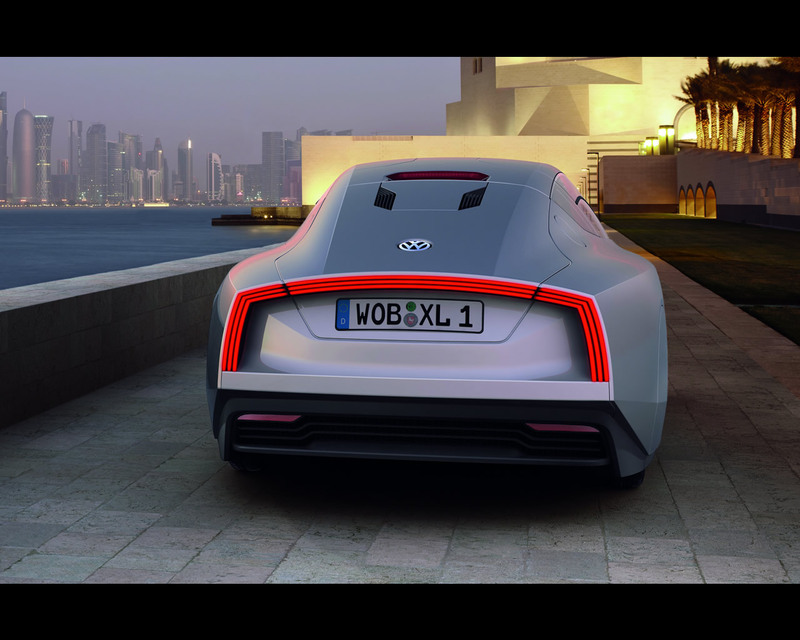 The feeling when driving the XL1 is truly dynamic − not based on pure power, rather on its pure efficiency. Two examples: 1) To travel at a constant speed of 100 km/h, the prototype only needs 6.2 kW/8.4 PS – a fraction of the performance of today’s cars (Golf 1.6 TDI with 77 kW and 7-speed DSG: 13.2 kW/17.9 PS). 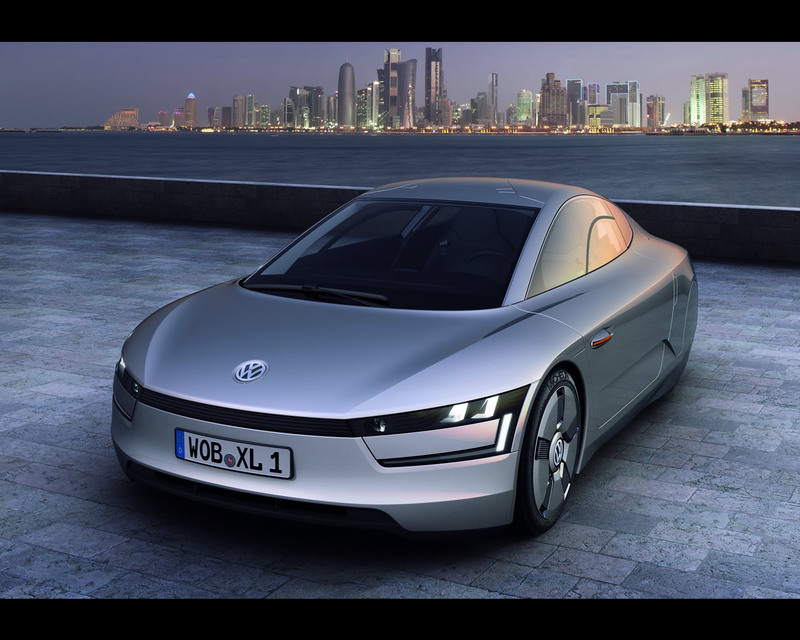 2) In electric mode, the XL1 needs less than 0.1 kWh (82 Wh/km) to complete a one kilometre driving course. These are record values. 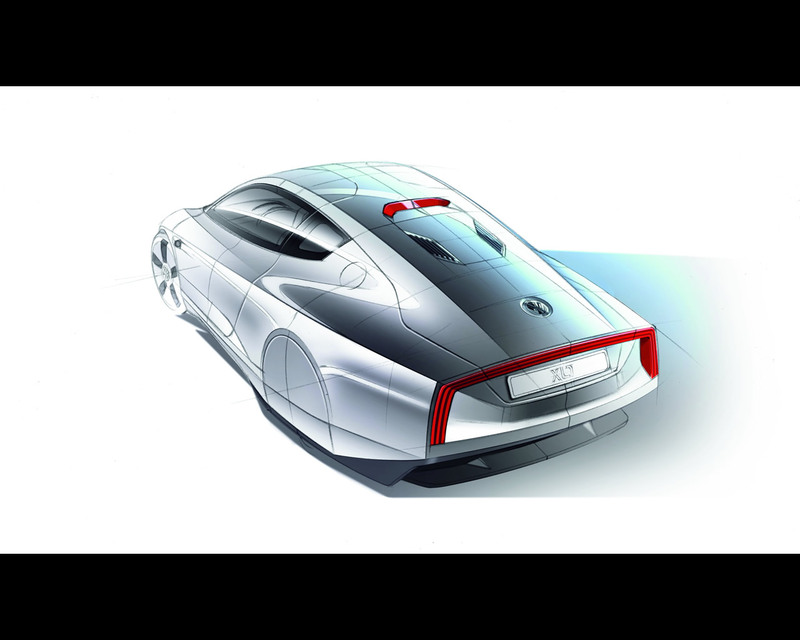 When the full power of the hybrid system is engaged, the Volkswagen prototype accelerates from 0 to 100 km/h in just 11.9 seconds; its top speed is 160 km/h (electronically limited). Yet these numbers alone do not tell the whole story: Since the XL1 weighs just 795 kg, the drive system has an easy job of propelling the car. When full power is needed, Qatar 2011 / XL1 / VOLKSWAGEN / 03 the electric motor, which can deliver 100 Newton metres of torque from a standstill, works as a booster to support the TDI engine (120 Newton metres torque). Together, the TDI and E-motor deliver a maximum torque of 140 Newton metres in boosting mode. With the new XL1, Volkswagen is implementing a plug-in hybrid concept, which utilises the fuel efficient technology of the common rail turbodiesel (TDI) and the dual clutch transmission (DSG). The TDI generates its stated maximum power of 35 kW/48 PS from just 0.8 litre displacement. The entire hybrid unit is housed above the vehicle’s driven rear axle. The actual hybrid module with electric motor and clutch is positioned between the TDI and the 7-speed DSG; this module was integrated in the DSG transmission case in place of the usual flywheel. 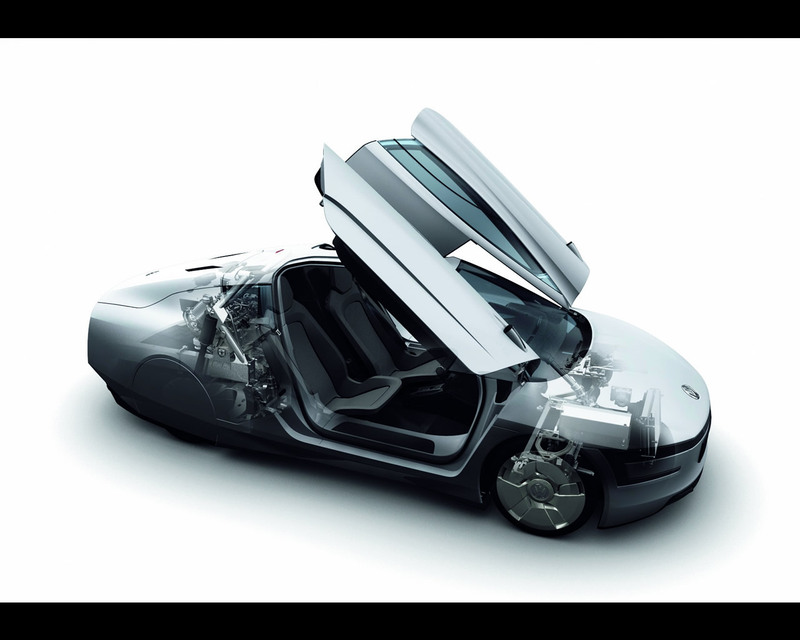 The integrated lithium-ion battery supplies the E-motor with energy. The high voltage energy flow from and to the battery or E-motor is managed by the power electronics, which operates at 220 Volts. The XL1’s body electrical system is supplied with the necessary 12 Volts through a DC/DC converter. Interplay of E-motor and TDI engine: The E-motor supports the TDI in acceleration (boosting), but as described it can also power the XL1 prototype on its own for a distance of up to 35 km. In this mode, the TDI is decoupled from the drivetrain by disengaging a clutch, and it is shut down. Meanwhile, the clutch on the gearbox side remains closed, so the DSG is fully engaged with the electric motor. Important: The driver can choose to drive the XL1 in pure electric mode (provided that the battery is sufficiently charged). As soon as the electric mode button on the instrument panel is pressed, the car is propelled exclusively by electrical power.